On August 9, 2018, the Urgent Care Association (UCA) hosted a webinar conducted by PatientBond titled, How Urgent Care Can Operate Like the World’s Most Successful Consumer and Retail Companies. 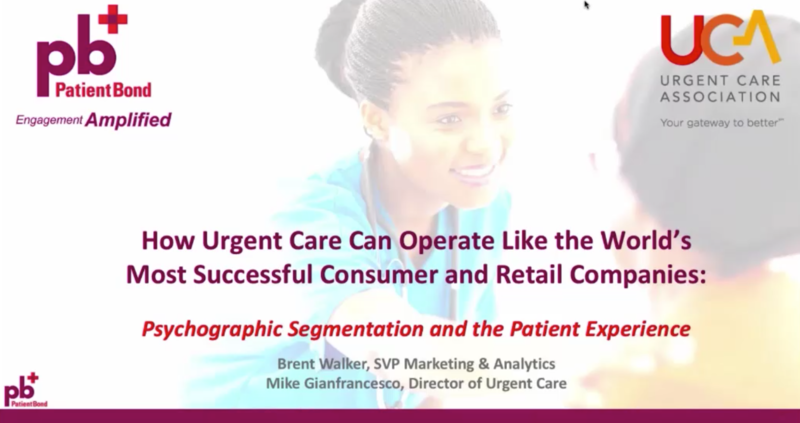 This webinar repeated a presentation delivered to a standing room-only crowd at the UCA Urgent Care Convention & Expo in Las Vegas in May 2018. This presentation applies mainly to urgent care. Do you also work with health systems? Yes, we do work with many health systems, hospitals, payers and other healthcare organizations. The PatientBond platform is flexible and can be used to amplify patient engagement through dozens of proven use cases and applications across all types of healthcare stakeholders. Does PatientBond work with DocuTap, Practice Velocity or other EHR vendors? We have strong relationships with both DocuTap and Practice Velocity in addition to many other EMRs and EHR vendors – like eClinicalWorks, Athena, etc. We’ve got the data feeds already set up for these clients that are already using PatientBond today. The retail examples you used to explain psychographics were all “billion dollar companies.” How does this apply to a small operation like an urgent care center? The size of a healthcare organization does not matter; PatientBond can be leveraged to amplify and improve patient engagement whether you are a single location urgent care clinic or a hundred location integrated health system or a national health insurance company. The reason billion dollar companies are used as examples is that the development of a psychographic segmentation model requires resources in the high six figures. Moreover, 50 percent of the time, a psychographic segmentation model will not be as predictive as desired or able to be operationalized. PatientBond’s proprietary psychographic model is the product of more than 15 years of work and evolution, developed from the work led by healthcare consumer experts at Procter & Gamble. It has been proven effective in driving positive health behaviors and marketing, and the cost is included in PatientBond’s pricing, which is extremely reasonable (with high ROI) for an urgent care center. The cost depends on the actual package that you choose. We’re more than happy to discuss price in a one-on-one phone call. I will say the average price of a package is less than $200/location/month and that’s even for a single location entity. We have discounts for multiple locations. We try to make this as affordable and as competitive as possible. Do we have to use the psychographics? What if we just want to use the PatientBond platform to communicate with our patients without psychographics? Using PatientBond without psychographics is also part of the package offering. You would get your encounter follow-up, your care messaging, your survey, you would have all of that. We offer many packages and options to suit your operational needs. Can you get packages a la carte? Absolutely, you can buy them a la carte. What a lot of our customers like to do, or how they started, was they’ll test drive a single package and see the great results that we showed today and then they’ll say, “You know what? Let me try that patient loyalty package,” or “You know what? I’m already on patient payments, let me go with the psychographic marketing package.” Or they start out with the marketing package and [when] they see the power of the psychographics, they want to get into loyalty. So yes, absolutely we do it a la carte. What data is your psychographic segmentation based on? How can you tell what is motivating people? PatientBond’s psychographic segmentation model was developed from primary market research, in which we surveyed a representative sample of adults age 18+, mirroring the U.S. Census. The survey included several hundred attitudinal, belief-based and behavior questions, and a factor analysis using statistical clustering procedures identified groups of people who answered the survey questions in a similar manner. We have conducted many studies since the original was fielded in 2013, and the model has held stable over the years. The PatientBond model is a 4th generation model, evolved from three previous models developed by our healthcare consumer experts while they were employed at P&G over 15 years. Two decades of market research insights and in-field experience with the psychographic models have uncovered segment motivations and the ways to trigger desired behaviors. Typical deployment time from signatures to a go live is about 14 business days. What type of staff training does this solution require? PatientBond is a managed service solution. We do everything for you. We recognize that urgent care runs lean and mean; you have the staff there based on seasonal volume or based on the day of the week, so we really do all of the heavy lifting. The only training that is required, if you’d like it, is a one-hour dashboard training, should you choose to utilize the dashboard. If not, there’s no training at all. I want to stress here that you’re not shutting any of your centers down for half a day to train your staff. We are running these workflows in perpetuity. We’re like another head without having to pay for the headcount. How do we identify the patients’ psychographic segment? An urgent care center doesn’t want every patient to take a survey to identify their segment. The most accurate and predictive way to identify a patient’s psychographic segment is to answer a 12-question survey, which we call the “Classifier.” It only takes a minute to answer and is 91.1% predictive as to which segment a patient or other consumer belongs. However, we do understand that an urgent care center may not want to have patients answer a survey when they visit the facility; after all, the patients are there to be seen quickly and efficiently, and answering a survey adds a step to the care process. PatientBond works with a national data compiler that has developed records on adults age 18+ across the U.S. through third party data sources. This is similar to a credit agency developing a credit score for consumers based on past purchase, loan repayment and other financial behaviors. The data scientists at the national data compiler developed an algorithm to statistically project the PatientBond psychographic segments across the U.S. population. While a statistical projection is not as accurate as answering the 12-question survey, it gives us a segment assignment that is three times greater than random chance. PatientBond can append a client’s EMR/EHR or practice management system with each patient’s segment assignment during the set-up process. How does the platform differ from having a CRM platform? At its core, PatientBond is a digital engagement platform. It engages patients through email, text messages, automated phone calls and delivering information through smartphone apps and portals as well. We are not a traditional CRM company in the sense that it is not a platform that is designed to handle millions and millions of customer records and then track sales leads. 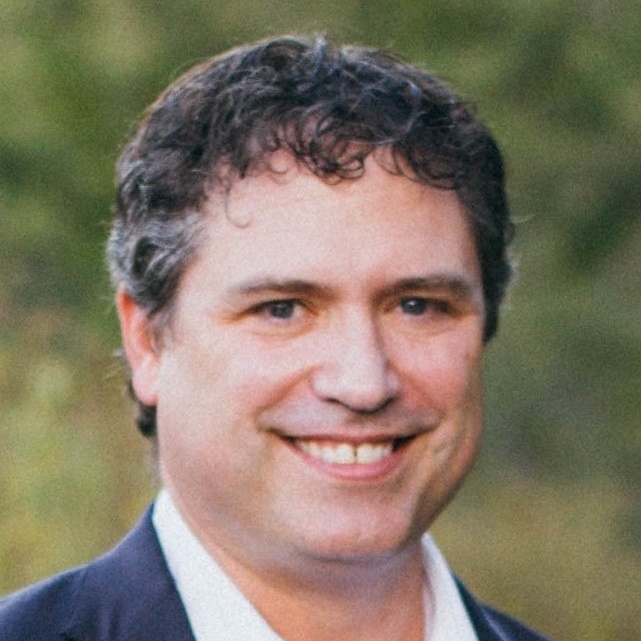 But having said that, a lot of the capabilities that we have built, especially for the smaller urgent care operations — those with less than 20 locations — there are enough “CRM Lite” capabilities that we have in the application that allow you to essentially have a 360-degree view of your patient interactions and your patient engagement through a very intuitive dashboard. But in most cases, especially with larger organizations, we sit alongside the CRM application and we use consumer data from the CRM application to do the outreach and then put information back into the CRM database. Do you have any market segmentation for orthopedics, dermatology? Yes. In our national studies, we ask whether respondents have one or more of 50+ health conditions, including skin conditions, and well as whether they have had a hip or knee replacement. Moreover, PatientBond has been working with Massachusetts General Hospital’s orthopedic division to reduce 30-day hospital readmissions for a form of spine surgery with very promising results. How does the model (message/channel/cadence) change the follow-up process after an appointment? Who gets contacted and how? Are there different segments when it comes to pediatrics or caregivers? In our studies, we ask whether respondents are caregivers for children and/or adults, so we do have insights on caregivers and the psychographic segments. However, our model is based on the consumption of healthcare, not the provision of care, and it’s only valid for adults age 18+. The segmentation model is designed to understand and predict approaches to health and wellness for oneself versus others. That said, we have been working with a children’s hospital to see how the model plays out in a pediatric setting and we’ve been learning some interesting things. Initial results indicate that parents may adopt the behaviors of other segments for their children while they continue to act like their segments for themselves. PatientBond’s psychographic model seeks to change behaviors, not change motivations. We know a segment’s behavior can change if given the right motivation. There is still a lot of work to be done in the caregiving space. What is the correlation between psychographics and loyalty? Psychographics can provide insights into what drives loyalty. Important to understand is that Satisfaction alone does not lead to Loyalty. Satisfaction plus the perceived Value of a product or service leads to Loyalty. A consumer – or patient – can be highly satisfied with the performance of a given product, but if that product is not particularly important or relevant for him/her, it won’t generate Loyalty. Psychographics can help inform what consumers or patients value and are motivated by. There are a lot of companies that offer services like automated communications and surveys. What makes PatientBond different? Number 1 is that in one platform, you have SMS capability to deliver these messages, you have email and you also have Interactive Voice Response as well. So you have those three communication channels. On top of that, obviously, the psychographic segmentation that you saw today is a huge differentiator in the marketplace. We’re a managed service partner, which means we’re going to manage the solution for you – you’re not hiring anybody extra; we’re running in the background in perpetuity. Overall, the depth and breadth of the platform is going to allow us to bring you that single vendor solution.